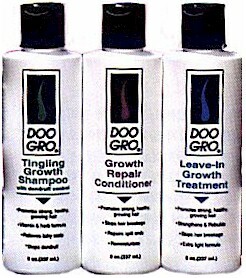 Doo Gro® Leave-in Growth Treatment helps promote strong, health, growing hair. Its unique non-greasy, non-oily formula repairs damaged hair and mends split ends. It also adds luster, conditions, softens and adds beautiful shine to hair. This Leave-in Growth Treatment is extra light and safe to use on all types of hair including color treated, bleached and relaxed.